What motivated you to start Wight Sails? We first developed the idea almost three years ago. I am a sailor and live on the Isle of Wight and was asked to dump a sail one day. I thought of the waste and damage to the environment. As an entreprenuer I wondered whether there was a way I could (a) rescue sails and help protect the environment and (b) make a business from it. My partner, Marcia, is a designer and together we sat down and had a good look at sailcloth. Sailmakers have been making bags for centuries, but no one was making quality products from used sailcloth. Where do you source your sails from? A vast range of places and people. We have sail collection stations on the Island at a number of yacht clubs where sailors can drop off their sails, but we receive sails from 70 year old windsurfers who have given up to people who find them in their sheds. We also offer a free postal collection service for anyone to send us their sails. We will pay postage or put that towards the cost of a product. Why are sails such a good material to work with? On the one hand they are strong, water repellent and last a very long time. On the other hand, we wouldn’t say they are ‘good’ material to work with. Because they are tough they are stubborn and there is a real skill in being able to turn sailcloth into products, ask any sailmaker. What’s the process for transforming an old sail into a new item? When an old sail comes through the door we decide what product line suits best. If soft, it goes in the cushion and seat pile, slightly stiffer and it goes in the windbreak pile and so forth. We then strip the sail of its metal parts (we use these as direction on other products) , we strip out any rope that is sewn in (this is also used for other products) and then we set about cutting out. Really dirty sails are washed and more often than not the only way to do it is by hand! Do you have any best-sellers? 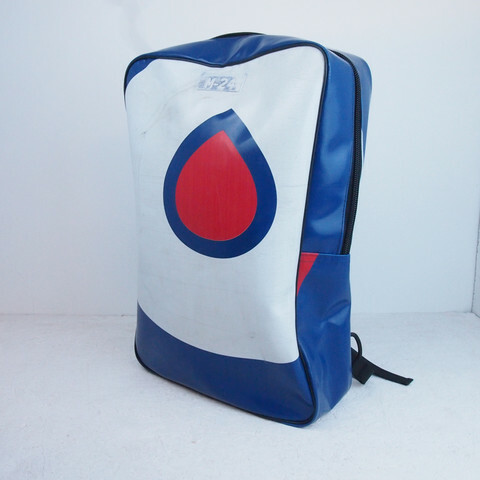 It is hard to pinpoint as it is all popular, but windbreaks, beach bags, wash bags, deck chairs, crew bags, doorstops (in retail) tend to be always popular. You also offer to up-cycle customer’s personal sails – have you ever had any unusual requests? Nothing out of the ordinary. Most people like their boat number to be shown or have their name attached to a product if made form their own sails. We will soon announce a major relationship with a very well know brand we have been working with and we are very excited by this. We will also be announcing a limited range of products from the sail of a boat sailed by a very famous yachtswoman. We are also expanding, moving out from our small workshop into a bigger one and taking on some more people. Well it definitely sounds like there are exciting times ahead! I think my favourite is the Beach bag which is £43 and the wash bags which are £30. They’re super light, quick drying, easy to clean, durable and saving the planet! You can buy Wight Sails products from their website www.wightsails.com they have a huge range of products including deck chairs, cushions, iPad covers and wine carriers. You can also follow them on Twitter and Facebook. If you’re doing anything interesting with unusual materials please get in touch- I love finding out about anything quirky and innovating especially when it involves saving the planet! One of the best things about running my own shop is the interesting and diverse people I meet. Recently Mat Dusting got in contact The Perching Post about his fantastic company, M-24, that makes bags from recycled truck tarpaulin. Each bag is different due to the different types of tarpaulin he collects. It’s a brilliant, versitile, extremely durable product which come in 5 different designs: Jerry Can, Oil Drum, Pylon, Tanker and my favourite Eddie Stobart Messenger! Take a look…. M-24 upcycle used/discarded lorry curtains and seat belts into funky functional bags. These include Backpacks, Duffel bags and Ski bags. By biggest fear is being normal! I want to create products and business that change the world. (Big dream). I have been inspired by people around me to start a business; my dad has created a very successful business from nothing and has given me great confidence to pursue my own ventures. Some of my friends have created successfully tech businesses from nothing and now working on loads of exciting projects. I worked for a large corporation during a placement year at university. This was a fantastic experience where I learned a lot about myself. I knew at the end of the 12 months I didn’t want to work in a standard 9-5 job. Some of the faces of people who had been working there for years looked so demoralised and depressed. I think the greatest motivation is being in control of your future, knowing no limits and fulfilling dreams in your head. When did you start M-24? M-24 started around March 2012. I started playing around with left over material on the farm to create a durable ski bag. I experimented with old sand bags and bits of plastic and soon found a piece of leftover lorry curtain. I cleaned it up, cut it up and stitched it into a crude ski bag shape. I made a few more prototypes using local leather stitching experts and soon came up with a design. I showed my friends and family the products and they loved them. What support have you had, Grants/ Mentor? Shortly after starting M-24, I found out about an Enterprise program the Princes Trust were running. I signed up and 2 months later received a start-up loan of £2000 and a personal business mentor. M-24 came 1st during Aprils Shell-livewire competition. We won £1000 and have been entered into a national award for Entrepreneur of the Year. There have been many hurdles over the last 12 months. I’ve been running this business on my own from home. Being on your own most days can be hard. Keeping myself motivated and focused is the biggest challenge. Most of my friends work in the city earning good salaries and living comfortably. It’s not easy working long hours and earning little while your friends are doing the opposite. We’ve been accepted into a pop up shop on KINGS RD London from 16th -31st July 2013. I’m now working with the Stobart group (Eddie Stobart) to design an exclusive range of bags and help them recycle some of their old material. We want to become a nationally recognised British brand. Think big! Believe in yourself, follow your gut! Start small! Don’t throw money at your idea at the early stages. Test your idea first. Bootstrap your business. You will hopefully soon be able to buy M-24 products at The Perching Post but in the mean time you can buy them on M-24’s website, you can also follow M-24 on twitter. When you buy an M-24 product, you’re helping to reduce UK landfill thus helping to save the planet and helping a local UK business.